Price elasticity of demand for each solution. 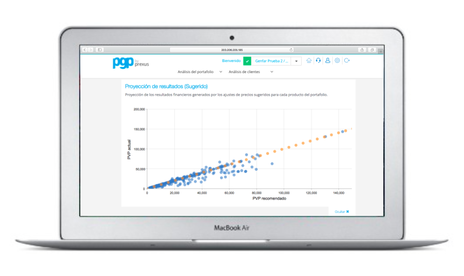 Each time the PGP is updated, the optimum price of each solution of the portfolio is obtained, as well as the projection of the impact on average price, units, income and gross contribution. It is also possible to simulate other scenarios, in addition to the one suggested by the tool. Under-paid customers, who could stop buying or selling your solutions. Increase your annual gross contribution between 3% and 15%. Even in cases as conservative as only a 1% increase, pay-out your annual investment up to 15 times. The Software-as-a-Service scheme of our PGP, allows you to have all the necessary processing power without depending on your company's infrastructure. The interface is designed so that it can be used on any type of device—PC or tablet—with an internet connection. Import and export to Excel with just one click. It is also possible to connect the PGP with the database of your ERP. Pay only for what you need. Our annual fees are adjusted to the gross annual contribution level of your business and the managed number of records. Enjoy all the automatic and free improvements made periodically to the tool. Assign permissions to as many people in your organization as you deem necessary, being sure that you are working on the same information. The annual fee includes unlimited remote support to solve operative questions. It is also 100% consumable in face-to-face sessions to evaluate results and update the strategic configuration of the PGP. Our tool is hosted on a dedicated server with the highest standards of security and information backup.